Licence holders for StickyNotePages will be provided with an ActiveC account to manage their contact and product licence information. The account management pages also allow you to create and assign Notepad accounts to others who will be using StickyNotePages with you. Managing your ActiveC Account is simple - just head to account.activec.biz/accounts/login or follow the links from the main website, where you will be asked to sign in. 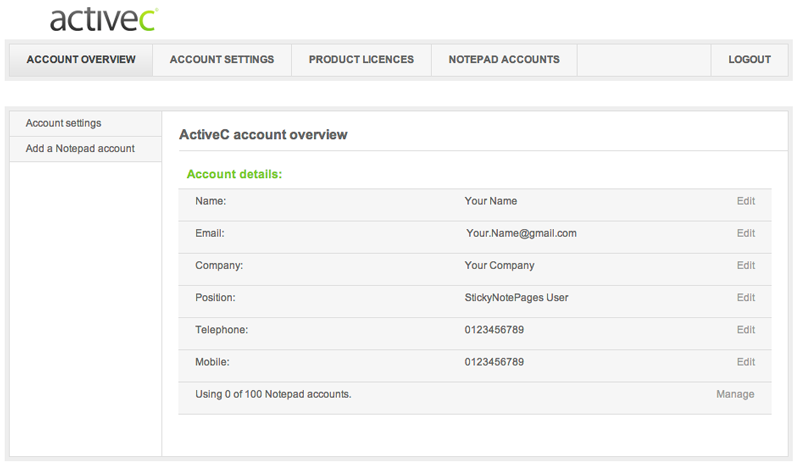 After signing in, you will see the Account Overview screen, which contains basic contact information for your account.